I was fortunate enough to be loaned a BMS board that had been burnt out while trying to converted a Leaf battery pack into a 4 x 100 volt configuration for use in another vehicle. This is the first time I have looked into a battery controller so some of what I say may be common knowledge. 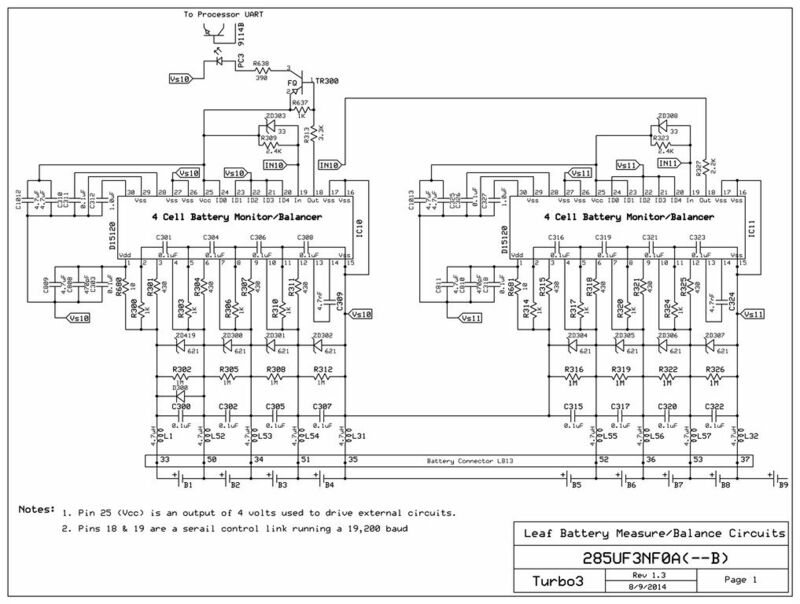 To me it is all new but I though it could be useful to others to know more about the inner working of the battery balancing circuits and how it interfaces with the Leaf. The board consists of two sections. 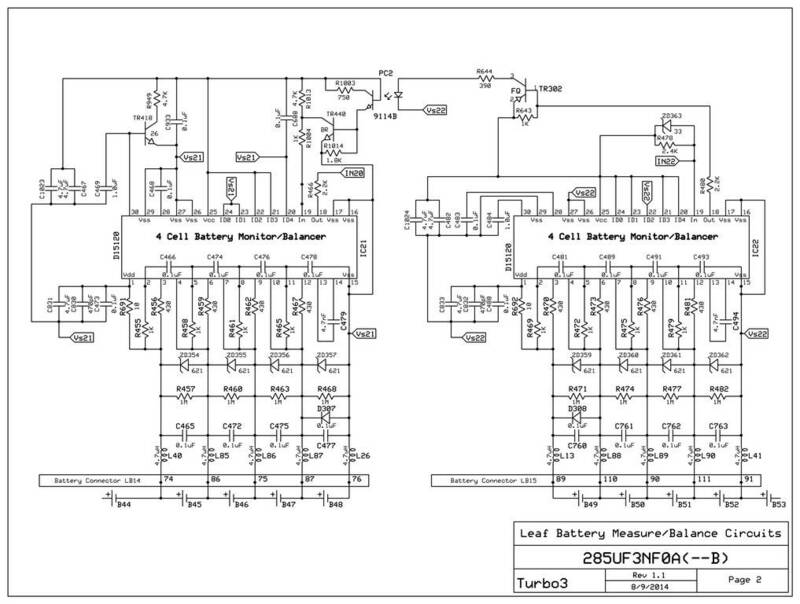 The first section is common to all ECUs in the Leaf with a CAN interface and RISC processor. 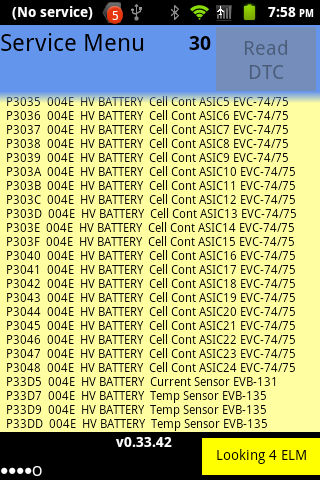 This is the part that Leaf Spy communicates with to get battery voltages and shunt settings. The second section is almost totally isolated from the first and consists of 24 custom ASICs that monitor the 96 cell pairs. This is the section I have been looking into in detail. The most interesting part is that the custom ASIC part is coupled to the first section through three photocouplers. Communications with the ASICs is through a serial link starting with a UART pin on the RISC processor and going through the first photocoupler. The output of that photocoupler is looped through the first 12 ASICs then another photocoupler then 12 more ASICs and finally through the last photocoupler back to the RISC processors input UART. Each ASIC is actually an island onto itself. It gets its power from the four cells it is monitoring and only has a single input signal from its neighbor which with a zener diode is prevent from going negative. All this isolation is required because the full battery voltage of up to 393 volts is being monitored on a standard circuit board. There is a clear insulating over coating on this section to prevent any leakage that could result in a catastrophic failure of the board. I am guessing that the zener diodes on the inputs serve two functions. One to dampen any voltage spikes above 6.2 volts. Second to allow the ASIC to function even if one cell is open/shorted. This is important as the command and status must go through all 24 ASICs so they all need to be powered up. Here is a schematic of the last two ASICs in the chain before the data is shifted back to the processor. Note that the shunt resistor appears to be the 430 ohm 250 mw resistor. So any balancing is going to take a long time at less than a 10 ma load. Warning: If you are going to try to rewire the BMS to operate with a different battery configuration best to really study this wiring diagram so you understand the voltages your rewiring will put on the ASIC. These are custom chips and as far as I know are only available internally to Nissan or by stripping them off another BMS board. This shows the last two ASICs in the string before sending data back to the processor through the photocoupler. The Service Plug that opens the high voltage circuit requires that the BMS also be split into two isolated sections. This page shows the photocoupler used to isolate the serial control signal between the two groups of 12 ASICs. Note that the negative side of cell 48 is not connected to the positive side of cell 49. If this was not done then when the Service Plug was pulled all the power would try to pass through that connection on the BMS board burning it out in a short order. This shows the first two ASICs in the string with the right one getting commands from the processor through the photocoupler. Not sure of the purpose of TR450. It seems to allow the ASIC to put a load on the ASIC generated Vcc used to power the photocoupler. Last edited by Turbo3 on Sun Aug 10, 2014 11:18 am, edited 4 times in total. Thanks for sharing this Jim. Very good information that will come in handy when attempting to use a retired Leaf battery for solar storage. One minor correction which I will fix on the next update of the schematics is that what I list for part numbers of the ASICs are actually different between sides. There are actually two numbers on each ASIC and the one I had assumed was the part number is the one that is different. For the top side it is 1240KX200 as listed on the current schematic but on the back side it is 1239KX219. Cells 1 thru 4 are handled by the top and 5-8 on the back side. This pattern alternates down the board. The top number on each chip is D15120 and is the same on all 24 ASICs on the board I have. So perhaps that is the real part number and the other is a date/production code. If anyone else has access to a BMS board please post all the numbers you see on the chips and their location on the board (top/bottom). I see no reason why there would be a need for two different chips as their location on the board is programmed with the 5 ID pins and all the wiring is the same. After thinking about it I am now pretty sure the 1239KX219 and 1240KX200 are date/production codes. Dates would be 2012 39th week and 2012 40th week. The other characters are probably planet (KX) and batch. 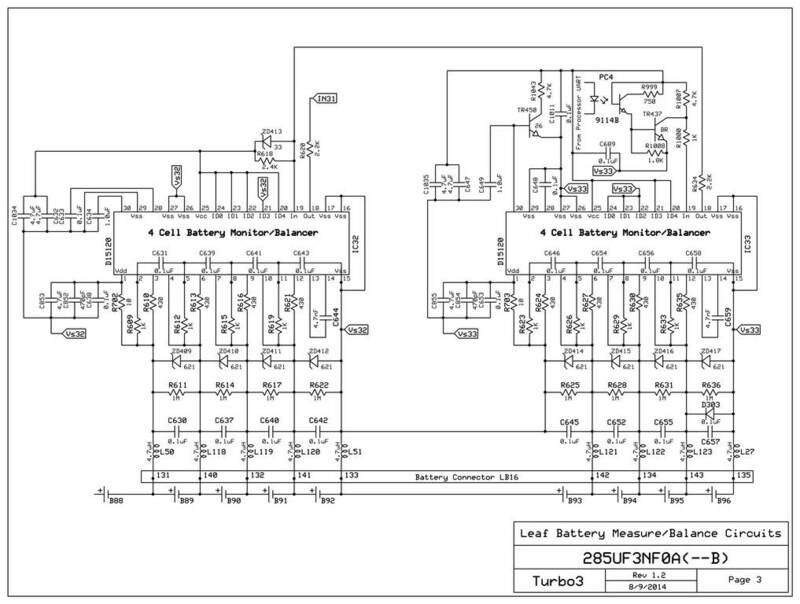 I will update the schematic with D15120 as the Nissan internal part number for the ASIC. The RISC processor has a code of 1216KP400 plus a part number of 70F3236BM. With the part number above the date code. So the format is the same. First part number then date code below. Numbers from a different board confirm that the part number of the ASIC is 15120 and the other numbers are the date codes. Yesterday I added a second schematic page to the first post covering the first two ASICs in the string and the logic that gets commands from the processor. Today I powered up the BMS on the bench. At first no CAN or attempt to communicate with the ASICs. 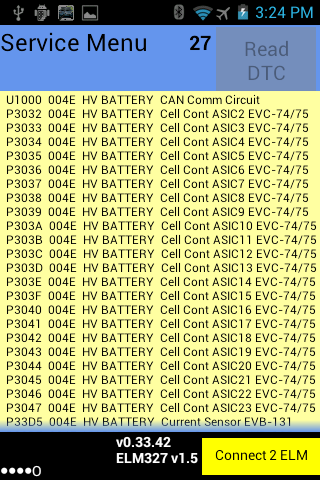 After I provided the "PWR" signal (Leaf on or charging) the CAN came alive and the processor tried to communicate with the ASICs. ASIC serial link runs at 19,200 baud or 52 usec per bit. Have only looked at it on an Oscilloscope to see the general protocol. There is a 10 msec start pulse then three bursts of around 4.5 msec, 9.28 msec and 9.63 msec. This repeats at an 80 msec rate. This is probably not the typical behavior since no data is ever coming back to the processor. Later I will capture the data on a logic analyzer and dump the serial bit stream for further hand analysis. 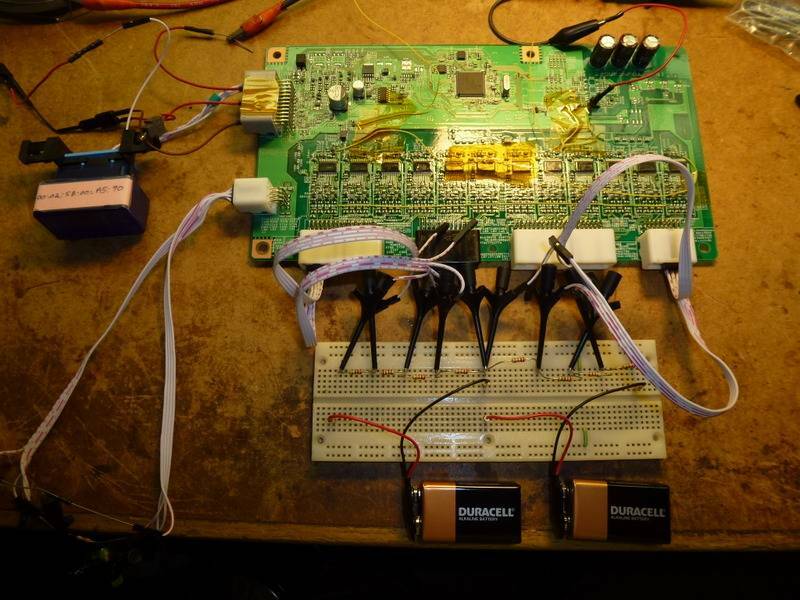 Later I will try to add a dummy set of batteries to power up the first ASIC in the chain and verify data comes out. Once I get data I can try feeding it directly back to the processor which should clear one of the DTCs. Here the DTCs you get from a standalone BMS with two burnt out ASIC modules. Today's experiment was to get two ASICs working so that the communications link with the processor could be completed. To do this I needed 8 batteries, four for eash ASIC. The solution was to use two 9 volt batteries and 8 resistors to make a voltage divider. After removing two resistors from the board to break the serial link to the unpowered ASICs an external resistor was added to connect the OUT from ASIC 24 to the IN of ASIC 1. 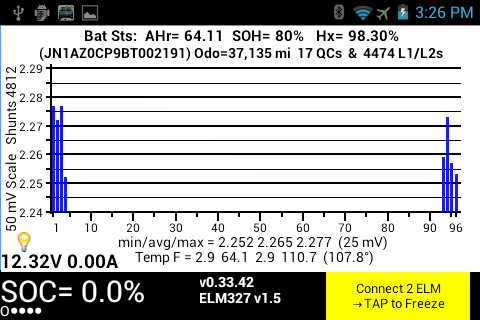 Here is what the completed test setup looks like on the bench. OBDII adapter to the left. Temperature sensor cable off bottom left to some resistors and a pot. Once everything was connected and powered up Leaf Spy Pro was used to read the "Leaf's" battery voltages. 18volts/8 cells = 2.25 volts per cell. Next the DTC were reset and read again and as expected ASICs 1 and 24 are no longer listed as being bad. Now that I have a "working" BMS I can start taking traces of the serial link and work on decoding its format. 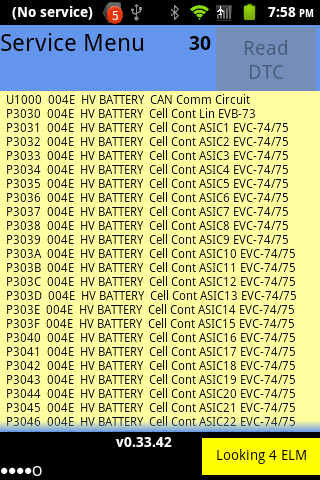 Can you do a log of the can "bus" with just the BMS on it to see what messages show up? Should confirm which messages we know are from the BMS and learn any that we don't know. Surprising that no one has been able to clone Consult III+ and build an interface multiplexer. a design of a Leaf interface multiplier, i.e. what basically the LeafSpy has done to an extent in software. In the context of the CAN interface, what do you mean by an interface multiplexer? There is nothing special about the Consult III+ hardware. It is the Consult III+ software that has all the smarts (knows the requests and response formats).